Anthony Everitt, a British academic who has published the biographies Cicero, Augustus, and Hadrian, begins The Rise of Athens: The Story of the World's Greatest Civilization by remembering how his grandmother, recognizing his fascination with ancient history, gave him three Penguin paperbacks: Homer's Illiad and Odyssey and Plato's Symposium. As a child, he "was mystified by the references to Hellenic homosexuality;" nevertheless, "Homer and Plato introduced me to a world that was new and ravishing, which, for all the tragedy and bloodshed, radiated the sunlight and luminous skies of free thought." But Grecian skies were not luminous with free thought at the very beginning. They took awhile to brighten, and daylight did not last long. Through a vivid use of military history, archaeology, and classical sources such as Herodotus, Thucydides, and Plutarch, Everitt shows how a motley village of pirates developed the world's first democracy and how they kept the Spartans and Persians at bay for almost two hundred years, only to fall back into darkness. The barren, rocky geography of Athens drove it to become a seafaring nation; her mythical founder was cunning Theseus, who slew the Minotaur with strength and guile. Coming out of its own "dark ages" around 800 B.C., Athens "became a republic governed by a group of noble families." But as people migrated to the city and population increased, so did poverty. "During the seventh and sixth centuries two ways were found of resolving this conflict between rich and poor," Everitt writes. "The first was to install one-man rule—in other words, a tyranny. The second was to invite an experienced politician to recommend radical constitutional reform—in other words, to hand over the problem to a wise, all-knowing lawgiver." Solon (c. 640-after 561 B.C.) was one of these lawgivers. Contending with the rich on one side and the poor on the other, he began the movement toward democracy. Pericles (c. 495-429 B.C. ), who prided himself on his upright governance, later helped to bring the democracy to full flower. These great men did their part to shape the city-state, but so did other factors—the flourishing of trade and prosperity, and even a tyrant or two. 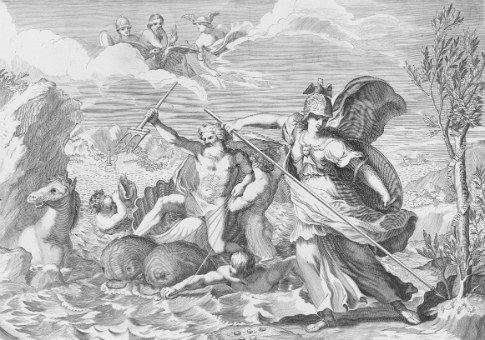 Everitt's history, while focused on Athens, also tells the stories of her rivals, Sparta and Persia. Sparta was the cultural and political opposite of Athens. The author quotes a Corinthian speaking to a Spartan, "They [the Athenians] are innovators, quick thinkers and swift at putting their plans into action, while you like to hold on to what you have, come up with no new ideas and when you do take action never achieve as much as you should have done." The Spartan ethos is illustrated by the story of a boy who let himself be disemboweled by the fox he was hiding under his cloak rather than be caught by its owner. The Persians, meanwhile, had conquered the kingdoms of Babylon and the Medes, and were looking to take the Hellenes next. The Great Kings, such as Cyrus and Darius, ruled the empire with an extensive bureaucracy and local bosses called satraps. The Athenians considered the Persians to be literal barbarians, uncivilized because they did not speak Greek. The Persians considered the Greeks mere pirates. Why did the Athenian project—which advanced drama, statuary, architecture, and philosophy so far—fail? In one word, hubris. Athens conquered and lorded over the Aegean islands, often viciously; rich demagogues battled poor demagogues; her rich political culture degenerated into corruption. Over the years, Athens overextended herself, lost her political power and clout, and eventually was reduced to a university and tourist town. In his preface, Everitt warns, "We in the West complacently note that a full independent Athenian democracy only lasted two hundred years or so. It is well to remember that our own democracies, in their complete form, have yet to last that long." He does not indicate who the complacent ones are or what he means by "their complete form"—does he mean America was not complete until the Emancipation Proclamation?—yet his warning is worth heeding.